As kids around the world anxiously await the fall opening of Warner Bros.' film "Harry Potter and the Sorcerer's Stone," an occult expert has released a documentary video, "Harry Potter: Witchcraft Repackaged, Making Evil Look Innocent," claiming the Harry Potter phenomenon is incompatible with Christianity. Where there should have been a back to Quirrel’s head, there was a face, the most terrible face Harry had ever seen. It was chalk white with glaring red eyes and slits for nostrils, like a snake. "See what I have become?" the face said. "Mere shadow and vapor. … I have form only when I can share another's body … but there have always been those willing to let me into their hearts and minds. … Unicorn blood has strengthened me these past weeks. … Once I have the Elixir of Life, I will be able to create a body of my own. …"
Voldemort, according to Hogwarts' Headmaster Albus Dumbledore, "is looking for another body to share. … not being truly alive, he cannot be killed." When Voldemort dispossessed Quirrell, the teacher died. But even some Christians are endorsing Harry Potter. In a November 1999 broadcast of his radio series "Breakpoint," author Chuck Colson commended Harry and his friends for their "courage, loyalty and a willingness to sacrifice for one another – even at the risk of their lives." Colson dismissed the pagan practices as "purely mechanical, as opposed to occultic. That is, Harry and his friends cast spells, read crystal balls and turn themselves into animals – but they don't make contact with a supernatural world. 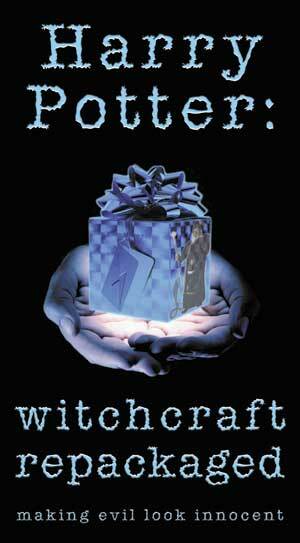 … [It's not] the kind of real-life witchcraft the Bible condemns." And popular Christian publication World Magazine reviewed book one of the series in May 1999, calling it "a delight – with a surprising bit of depth." Author Roy Maynard assured World readers that "Rowling … keeps it safe, inoffensive and non-occult. This is the realm of Gandalf and the Wizard of Id, not witchcraft. There is a fairy-tale order to it all in which, as Chesterton and Tolkien pointed out, magic must have rules, and good does not – cannot – mix with bad." "Christians are so naïve because they've been sheltered by Christian America," she said. "This very Christian culture, while it's being protective, it has also bred a sort of lukewarm Christian" that doesn't see evil as evil, the filmmaker concluded.